Welcome to the digital-photography-tips.net monthly ezine. I recently took a trip to Sydney and came back with an incredible number of photos of both the Opera House and the Harbour Bridge. Sydney is a stunningly attractive city, which means photographers get more than a little snap-happy! I arrived at the Circular Quay in Sydney with the Harbour Bridge on my left, and the Opera House on my right. And couldn’t stop clicking away at both! The trick here is to look through your photos, with the aim of finding ‘bits’ that you can use in your collage, rather than looking for ‘whole’ photos. In my example I have bits of the opera house. Never the whole thing. 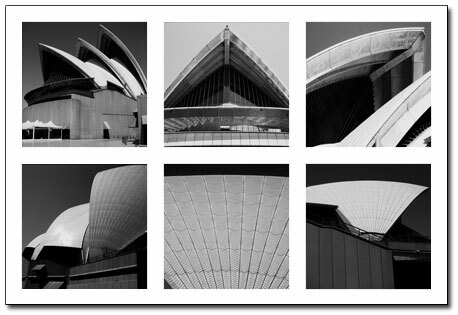 Anyone viewing the collage is in no doubt it’s the Opera House, even though there isn’t actually a photo of the whole of the Opera House itself. Making a collage like this is a neat way to combine a group of photos of the same thing into one image. In this section – tips and tricks to help you get the most out of Photoshop. These tips will always be based on Adobe Photoshop Elements – the home user version of the software package the pros use. Photoshop Elements has two halves to it. A photo browser and a photo editor. Most people are aware of the photo editor part. But the photo browser part is less used. This month my tip relates to Photoshop Elements photo browser – helping you organise your digital photo collection! In the next box, type an address. At this point, make sure you are connected to the internet for this to work. Once it has found the address you are looking for, Elements will attach a ‘location tag’ to the photos you selected. You can now find your photos by scrolling across the map! Further reading – the newest photography tips and tricks! Here’s the latest additions to the site, and a few other highlights, – always worth a look . . .
My aim is to share digital-photography-tips.net, and this newsletter with as many people around the world as possible– helping the whole world take better photos!